By now, you may have read that near the top of CHSRA's priority list is the construction of a long section of sufficiently straight, flat track in the Central Valley, e.g. between Merced and Bakersfield. The central maintenance facility for the trainsets will likely be sited at or near Castle Airport in Merced county. Today's post discusses why this is at least as important as the SF-SJ and LA-Anaheim segments. Part 2 will address the complicated issue of securing a suitable HSR alignment through downtown Fresno, given that the test track will later be used for commercial operations. First, FRA has not yet written any rules regarding the safe operation of trains at 220mph in the context of the US rail environment. In particular, CHSRA will seek a "Rule of Special Applicability", in essence a new set of rules that will initially only apply to CHSRA and its network. FRA had begun similar work for the Florida HSR system but shelved it when that effort was abandoned. Whatever rules it writes now will create a legal precedent for other HSR systems. That is precisely why the new Kerry-Specter bill calls for a new Office of High Speed Rail to be established within FRA, which has traditionally favored the interests of private rail freight operators over those of public passenger rail services. For the most part, FRA will leverage the deep experience of foreign HSR vendors and operators for rules on track and catenary construction, track geometry tolerances and creep documentation, signaling, infrastructure and trainset maintenance intervals, procedures, documentation standards etc. Special attention will need to be paid to environmental impacts such as noise - especially for nighttime cargo operations - and, to all aspects of safety. This includes signaling to avoid train-on-train collisions and track surveillance to detect people, livestock and/or wildlife that have wandered onto the tracks. It also includes the dynamic stability of trains and overhead catenary systems in normal operation as well as exceptional circumstances such as freak weather conditions, earthquakes etc. Detecting and responding to changes in track geometry due to minor seismic activity is another important aspect: special trackbed construction may be required where the alignment crosses slip-strike faults. Japan has decades of experience with high speed rail operations in earthquake country, including how to recover from service disruptions as quickly as possible. 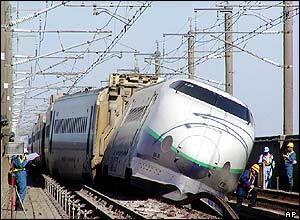 Only one bullet train has ever derailed during an earthquake, in Niigata prefecture in 2004. There were no casualties, but it took about four weeks to resume basic service. One politically sensitive issue is that HSR trains will share track with Caltrain in at least the DTX tunnel in downtown San Francisco and possibly, other short sections as well. CHSRA also plans to share track with Metrolink and freight trains from/to San Diego between Fullerton and Anaheim ARTIC and eventually, out to at least Irvine. Since at least some of these trains in both segments will use FRA-compliant rolling stock and, CHSRA wants to use non-compliant but proven European or Asian trainsets, it is vitally important to the success of the entire HSR venture that FRA create rules that permit mixed traffic subject to conditions yet to be defined. The powerful rail freight companies will vigorously lobby Congress to prevent any rule changes that would force them to invest and then maintain expensive upgrades to their infrastructure and/or locomotives. Related to that and to HR 2095 is the requirement to establish national standards for interoperable positive train control (PTC) systems. European railroads and their vendors have spent the last decade developing ETCS (Electronic Train Control System) in the context of ERTMS (European Rail Traffic Management System). A number of other countries including China, India and Mexico have decided to adopt the European system rather than develop their own. Japan had already developed functionally similar but incompatible systems. US efforts related to PTC technology centered on differential GPS, which neither of these foreign concepts rely on. Complicating the issue is that wireless data communications use different protocols in each geography, with multiple incompatible systems and incomplete coverage in the US. Add to that the inevitable homeland security concerns about relying on foreign-built systems in general and phreakers (phone hackers) in particular and, you can see why FRA rulemaking won't be easy. ERTMS level 1 is an overlay system that relies exclusively on electronic trackside devices called balises that automatically force a train to brake hard if it has not been given authority to pass them. The problem is that this infrastructure is expensive to construct and maintain because it still requires trackside signals and a lot of buried cabling. ERTMS level 2 relies on GSM-R wireless communications to eliminate much of this cost. There are still balises, but they are "dumbed down" to just broadcasting fixed messages. This level is generally considered essential for safe operations at 350km/h (~220mph) because drivers can no longer reliably read trackside signals at that speed. There have been a lot of teething troubles related to getting the wireless components to work reliably enough, one reason why tracks and trainsets already capable of supporting that speed are not yet operated at it. For good reason, railroad engineers always err on the side of caution. Second, CHSRA needs to conduct technical pre-qualification of vendor products. In addition to verifying claims that trainsets actually can run safely at 220mph in commercial operation, regardless of weather, the authority will need to look at interoperability with products from other vendors. After all, the objective is to put operations of both the infrastructure and the trains out to tender. Preferably, that means multiple competing train operators - possibly including some airlines - who will either buy their own trainsets and time slots at the central maintenance facility. Attracting this private investment will be much easier if there are multiple vendors to choose from. Indeed, CHSRA may well require all vendors who want to make it onto the shortlist to invest in kind, e.g. by making their premium offerings available on term leases. Alstom AGV, the successor to the TGV. Per unit of length, this design is actually lighter than conventional light rail (~1400 lbs/ft). The first customer will be NTV in Italy. FS ETR500 Frecciarossa. The latest generation of this Italian design is capable of 350km/h (217mph) but operations will be limited to 300km/h (187mph) until the kinks have been ironed out of ERTMS level 2. Siemens Velaro E, an uprated version of DB's ICE3. In service in Spain and China. Talgo 350, a lightweight design based on traditional push-pull tractor cars. The ungainly nose supposedly reduces noise and sway in heavy crosswinds. Kawasaki/Hitachi 700T, in service in Taiwan. JR East's flagship Fastech 360S was supposed to be a drop-in replacement for the ageing E2 fleet that is limited to 275km/h (~170mph). Electric trains normally rely on electric recuperation to decelerate, but headways (minimum separation of trains) are determined by emergency brake distances when this facility is unavailable. As top speeds increase, manufacturers have to resort to increasingly exotic and highly proprietary technologies to maximize line capacity for their customers. JR East already operates its shinkansen lines near capacity, so headways had to be maintained. This video shows one nose style on the development platform and the emergency air brakes, which instantly earned the design the nickname "nekomimi shinkansen" ("cat-eared bullet train"). In addition, very strict noise level regulations had to be met, in spite of a speed increase to 360km/h (~220mph). Neither goal was quite achieved, so these trains will operate at 320km/h (~200mph) instead. Note that all modern Japanese shinkansen designs feature active tilt mechanisms because the lines were built decades ago for lower speeds. A California version would run on tracks designed for safe operation at 220mph without recourse to tilt technology. Correction: JR East will actually bring the E5 series into commercial service at 320 km/h. This is based on technology developed with the purely experimental Fastech 360 trains (h/t to anon @ 9:13pm). Kawasaki is working on a new design capable of 350km/h with the code name efSET. KRRI/Rotem HSR-350X, an experimental design developed exclusively in Korea. The KTX series is separate and derived from Alstom TGV platforms. Finally, here is a peek inside an SNCF maintenance facility. Note that Alstom and Talgo designs feature Jacobs trucks located-in between cars. This is part of an articulated frame concept that permits shorter but wider cars. It also helps keep cars from toppling over or jackknifing in the event of a high-speed derailment, greatly reducing the risk of death or serious injury for anyone on board. The flip side is that the entire trainset must to be lifted if a single wheel or truck must be repaired or replaced. 1. Do multiple operators necessarily mean different kinds of trainsets? In the UK, new operators seem to take over the leases for in-service trainsets. 2. As I understand UK passenger operations, different firms compete (periodically) for different routes. Would a single operator have a monopoly on a particular route, say, LA-SF; another firm SD-Sacto; etc.? Or would competing operators run the same routes in different slots (akin to airline competition)? It should be noted that the Fastech 360S is a purely experimental train set. It will be the E5 Series Shinkansen that will debut in 2011 with Fastech 360S-derived technology. I'm impressed that the taiwan train rolling out ceremony didn't have any overhead wires. CHSRA has not yet decided how train operations will be structured and put out to tender. In the UK, there was a set of legacy rolling stock at the time of privatization. This will not be the case here. The starter line will compete directly with airlines, therefore it is likely that there will be several companies interested in providing competing service between the Bay Area and SoCal. San Diego-Sacramento, when it becomes possible, will be a much more marginal proposition. Traffic volume is light anyhow and HSR will not be as competitive on travel time at that distance. SF-SJ-Sacramento could have been profitable, but only via Altamont. Noteworthy tidbit: PEBO's and VPEJB's families will travel to the inauguration in Washington DC on the Amtrak Acela Express (second story in the clip). the Alstom tests at night show how final engineering, acceptance testing etc. can be conducted on a line already in commercial service. There is no need for a super-expensive dedicated high speed test line. Alstom did use a dedicated test circuit in the Czech Republic for preliminary tests at lower speeds. However, while La Poste does operate high speed cargo services in France using its distinctive yellow TGVs, they don't currently operate at night. If CHSRA intends to allow nighttime operations to maximize line utilization - perhaps based on especially quiet Talgo or JR East E5 trainsets (h/t to anon @ 9:13pm) - then it will be somewhat harder to secure test slots after commercial operations commence. Bombardier's Zefiro</a train sets, which have yet to be built, may also be considered in the mix. I decided against including the Bombardier Zefiro in my list because the company does not yet have a version capable of 220mph in regular commercial service. They claim to have the engineering chops to build one and, given their involvement in so many other HSR projects, that doesn't sound far-fetched. However, a bird in hand is worth ten in the air. CHSRA may prefer off-the-shelf designs with a proven track record in commercial service elsewhere in the world. So far, Canada has not even committed to a high-speed line of its own. If Bombardier were a US rather than a Canadian company, the politics would likely play out differently. As it is, Bombardier is just one of many foreign vendors who will try to win a slice of HSR business in California. It may well be willing to set up an R&D outfit or a manufacturing plant in California, but then so will the others. For example, Siemens already assembles light rail vehicles in Sacramento and could add an HSR assembly line fairly easily. Rafael, Could Siemen's add onto their site easily? I recall looking at an airial not too long ago and didn't see a lot fo room to add HSR assemply capability. Maybe further up or down the track? Why do we need a shiny new American standard for PTC, or some imported European standard that does not work, when we already have a perfectly good system up and running on the NEC, in the form of Amtrak's ACSES? ERTMS is barely even a standard at this point, more like an EU mandate. The only implementations so far have been of Level 2, which is basically like a cab signal system where wayside-to-train communication uses radio rather than a track circuit code. It still has all the expense of installing track circuits and the capacity limitations of a fixed block system. ETCS Level 3 would fix this, but there aren't any implementations of Level 3, nor is there even a specification for it at this point I think. It's just something that Brussels thinks would be nice to have. So I say, go with what works: the ACSES overlay on a coded track circuit cab signal system. Anon is right. The Acela experience far outshines anything in Europe or Asia. if Siemens did decide they wanted to get into the business of assembling HSR trainsets in California, I'm sure they could find somewhere to set up shop. It might not be at the same facility. I did not say that FRA should adopt ERTMS level 2. It'll probably be baked in a couple of years and, CHSRA may push for it to be adopted. However, freight railroads will now have to implement PTC not just in busy corridors near ports but also on routes used to transport hazardous materials. That may require a different approach in rural areas, e.g. one based on satellites or train-to-train radio transmissions. Btw, the Japanese standards and ERTMS level 1 work just fine. It's just that many railroads in Europe don't want the expense of having to install and maintain a wireline overlay signaling infrastructure on top of their existing national legacy equipment on their entire network. ACSES is currently limited to 150mph, whereas ERTMS works up to 500km/h (~310mph). As far as I can tell, ACSES uses the same basic kind of balise as the ERTMS specifies, so speed isn't an issue for that. And coded track circuits work well at any speed. I think the limit is more on the Acela train than anything else. As for ERTMS/ETCS, ETCS level 2 is basically an overlay system too: you still need the track circuit system, except instead of hooking it up to a signal, it's hooked up to a wire that goes back to the control center, where the computer does its calculation and transmits instructions to trains by radio. So, all the expense of lineside signal infrastructure for the track circuit blocks, plus all the expense and unreliability of the radios and central control center. For all that effort, you might as well go with a system that actually works in daily revenue service on a major line, rather than one that has only been implemented on a few pilot projects (some of which have since been dismantled). Oh and by the way, only the very newest Shinkansen, the N700 series, has a tilt mechanism, and even there it's only 1 degree, which is pretty small. There are non-Shinkansen express trains that have active tilting though, and I think that sort of thing is quite common.